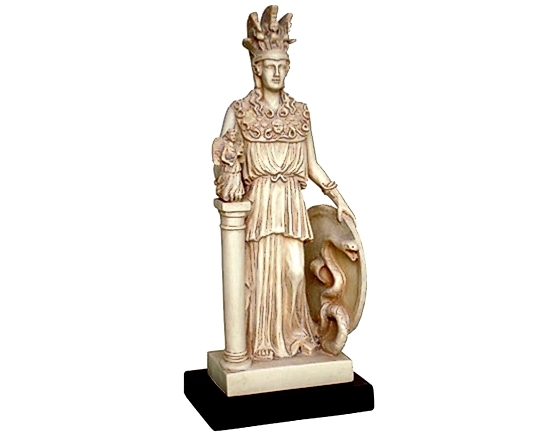 Athena was the Greek goddess of wisdom, war, the arts, industry, justice and skill. She was the favorite child of Zeus. She had sprung fully grown out of her father's head. Her mother was Metis, goddess of wisdom and Zeus' first wife. In fear that Metis would bear a son mightier than himself. Zeus swallowed her and she began to make a robe and helmet for her daughter. The hammering of the helmet caused Zeus great pain in the form of headaches and he cried out in agony. Skilled Hephaestus ran to his father and split his skull open and from it emerged Athena, fully grown and wearing her mother's robe and helmet. who holds his trident in front of him. 470 B.C. National Archaeological Museum, Athens. Athena and her uncle Poseidon were both very fond of a certain city in Greece. Both of them claimed the city and it was decided that the one that could give the finest gift should have it. Leading a procession of citizens, the two gods mounted the Acropolis. Poseidon struck the side of the cliff with his trident and a spring welled up. The people marveled, but the water was as salty as Poseidon's sea and it was not very useful. 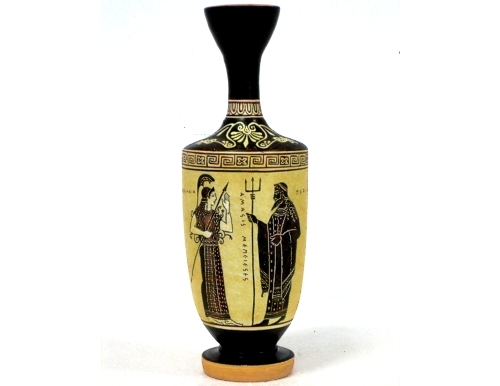 Athena's gift was an olive tree, which was better because it gave the people food, oil and wood. Athena named her city Athens. Athena is the patroness of various crafts, especially of weaving, as Athena Ergane, and was honored as such at festivals such as Chalceia. The metalwork of weapons also fell under her patronage. She led battles (Athena Promachos or the warrior maiden Athena Parthenos) as the disciplined, strategic side of war, in contrast to her brother Ares, the patron of violence, bloodlust and slaughter—"the raw force of war". Athena's wisdom includes the cunning intelligence (metis) of such figures as Odysseus. 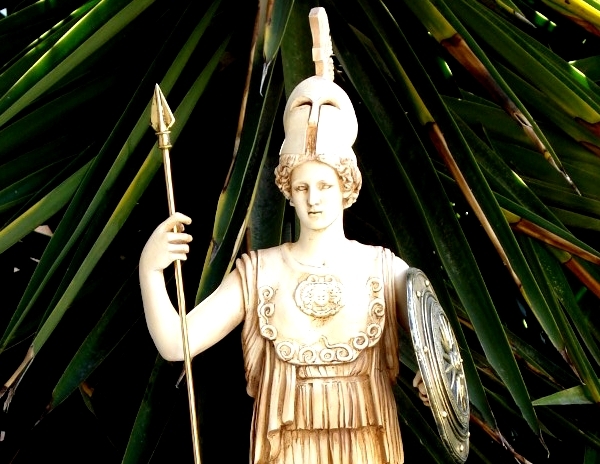 Athena appears in Greek mythology as the patron and helper of many heroes, including Odysseus, Jason, and Heracles. In Classical Greek myths, she never consorts with a lover, nor does she ever marry, earning thus the title Athena Parthenos (=virgin). Though Athena is a goddess of war strategy, she disliked fighting without purpose and preferred to use wisdom to settle predicaments. The goddess only encouraged fighting for a reasonable cause or to resolve conflict. 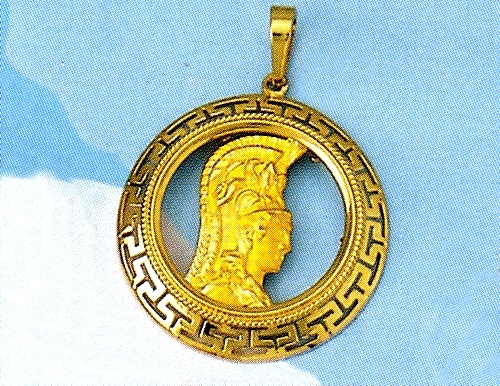 As patron of Athens she fought in the Trojan war on the side of the Achaeans. Athena springs out of Zeus's head. She is fully dressed, wearing a crested helmet, peplos, aegis and carrying a spear. 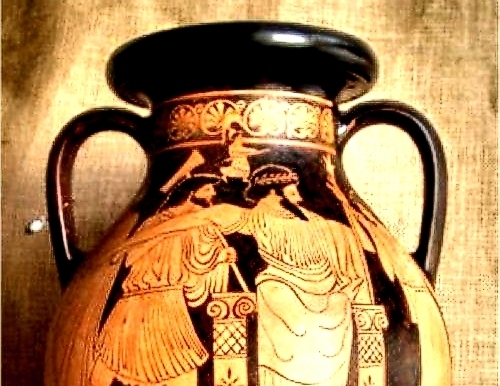 470 BC. British Museum, London.